Two Chinese satellites lifted off Saturday on top of a Long March 3B rocket and rode into orbit nearly 14,000 miles above Earth to expand the country’s space-based navigation network. The Long March 3B rocket lit its hydrazine-burning first stage and four strap-on boosters at 1229 GMT (8:29 a.m. EDT) Saturday and soared away from the Xichang launch center in southwestern China’s Sichuan province, according to the state-run Xinhua news agency. 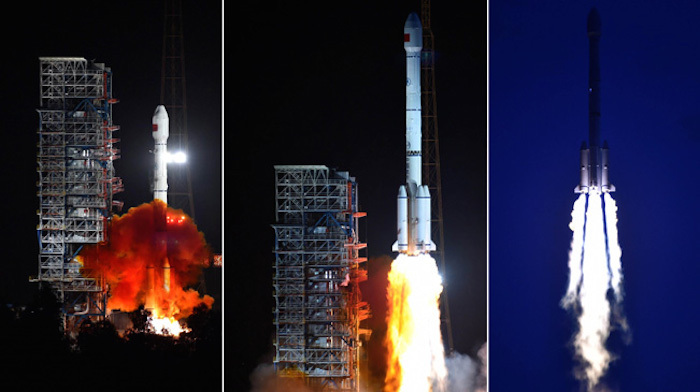 Liftoff occurred at 8:29 p.m. Beijing time, or around sunset at the mountainous Xichang launch base. A Yuanzheng upper stage injected the two Beidou satellites into a near-circular orbit about 22,000 kilometers, or 13,700 miles, above Earth more than three hours after liftoff. They are orbiting at an inclination of 55 degrees, according to tracking data released by the U.S. military. 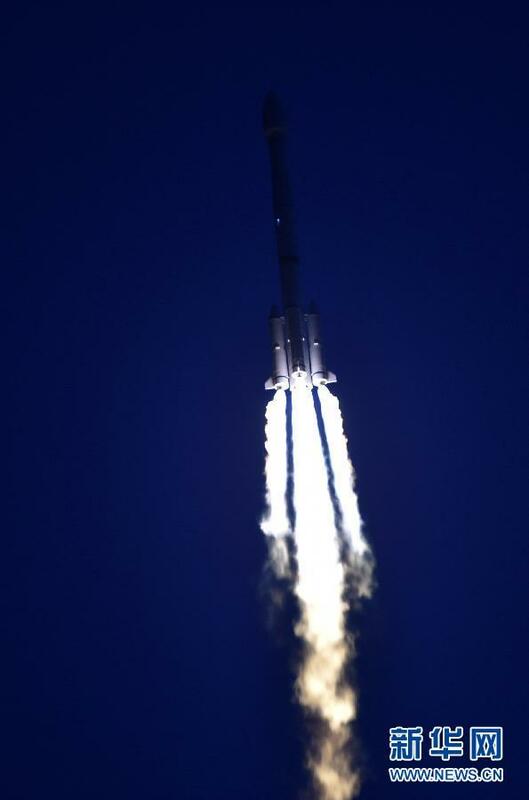 China’s Yuanzheng space tug, flying for the second time on a Long March launch vehicle, put the tandem payloads into an on-target orbit near their final operating positions. Long March rockets deployed previous Beidou satellite models into highly elliptical orbits, and the spacecraft had to use their own fuel to reach their final locations high above Earth. With the orbit achieved Saturday, the nearly one-ton Beidou satellites will not have to travel far to reach their intended operating posts at 13,300 miles altitude. 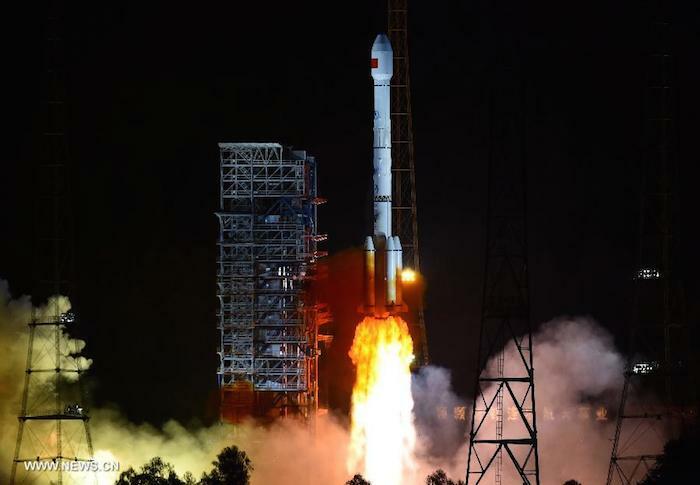 The satellites launched Saturday are the second and third units to reach orbit in a new 35-satellite constellation China is developing to provide global navigation coverage by 2020. Saturday’s launch put the first two of at least 27 satellites into medium Earth orbit, and a Long March mission in March placed the first of three Beidou spacecraft expected to go into an inclined orbit approximately 22,300 miles up. Five Beidou satellites will be stationed in low-inclination geosynchronous orbits 22,300 miles above the equator. When complete, the Beidou system will join the U.S. Air Force’s Global Positioning System, Russia’s Glonass satellite network, and Europe’s Galileo fleet — which is still being deployed — as the world’s four navigation services with global reach. The Beidou fleet’s expansion to worldwide service comes after it achieved initial operating capability with regional reach over the Asia-Pacific in December 2012. Beidou managers say the constellation will provide positioning services with an accuracy of 10 meters, or about 33 feet, speed estimates within less than one foot per second, and time measurements within 10 nanoseconds. Highlighting the Beidou network’s civilian applications, Chinese officials say the satellite fleet will aid in air, car and marine transportation, disaster relief, hydrological monitoring, and weather forecasting. The Chinese military will also be a prime user of Beidou navigation data. The third-generation Beidou satellites now launching feature advanced signal structure, inter-satellite links, and more accurate on-board clocks. At least one more Beidou launch is scheduled later this year.